(Copper Oval Sleeves Conform to Military Spec. MS51844. )Sleeves for eye, lap and stop sleeve splicing are available in either aluminum or copper in a wide variety of sizes ranging from 1/32″ to 1/2″ inclusive. 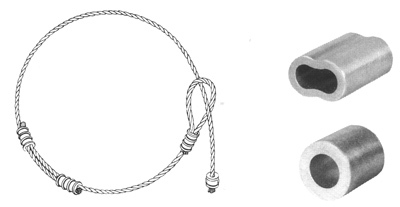 All oval sleeves (copper or aluminum) are capable of supporting a greater load than the rated breaking strength of the cable to which they are attached when properly applied with LOCOLOC® Hand Swagers to bare cable on 3×7, 7×7, 7×1 9 and 6×1 9 constructions. Stop sleeves are capable of holding only 1/3 to 1/2 of the rated breaking strength of the cable to which they are attached. All sizes and types are bulk packaged. CopperOval Sleeves available eitherplain, zinc, nickel, or tin plated. Plain copper supplied unless otherwise specified.